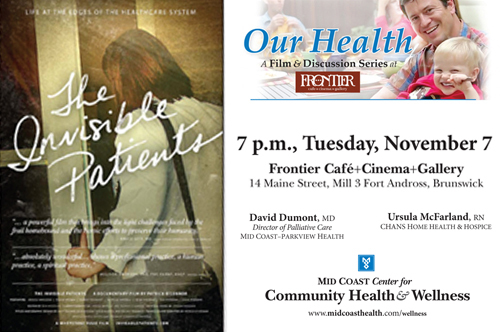 Join the Mid Coast Center for Community Health & Wellness for the Our Health Film Series at Frontier Cafe+Cinema+Gallery. On Tuesday, November 7, watch The Invisible Patients, a film chronicling a nurse practitioner and four homebound patients she cares for. The stories reveal a hidden, vulnerable population whose lives ask us to wrestle with not just healthcare policy, but today’s fraying social fabric. Guest panelists include David Dumont, MD, Director of Palliative Care at Mid Coast–Parkview Health and Ursula McFarland, RN, CHANS Home Health & Hospice. Admission is free, but space is limited. Tickets are required. Click here to get tickets to hold your seat online via Frontier’s website. For more information, please call (207) 725-5222.